My First Book Published !!! Story revolves around Daniel Grey, when moves in new town to start new life and he made some new friends. One day He found an old extremely rare violet diamond locket in his attic of his house. 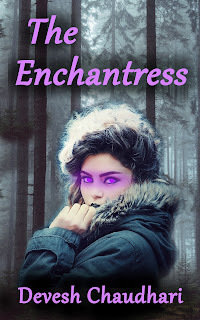 He begins to have scary paranormal encounter due to crystal powers of violet diamond, later he met a beautiful girl named Olivia who is a powerful Enchantress. The story gets more complicated when Daniel discovers that Olivia is a ghost who is haunting him because she has madly fallen in loves with him and she had her own evil plans for him. The violet diamond is cursed by Olivia before her death and destroying the violet diamond locket is the only way to stop Olivia. Join the Adventure of Daniel Grey on his journey to break the curse of Olivia ! !